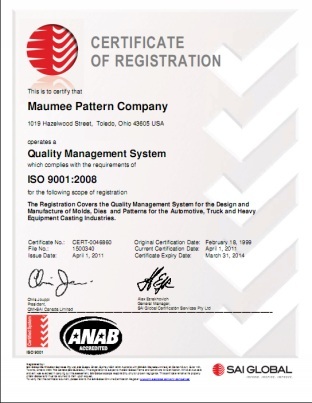 Maumee Pattern was among the first companies worldwide to receive ANSI-RAB Accredited Registration to QS-9000, TE (Tooling & Equipment) and ISO-9001 (Design) on 2/18/1999. Meticulous procedures created with assistance from outside consultants, have instilled a philosophy of "Continuous Improvement" throughout all departments at Maumee Pattern. 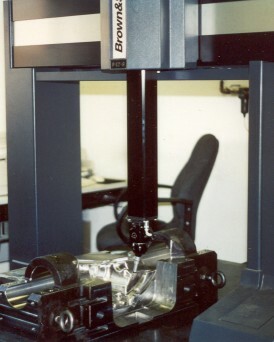 At Maumee Pattern CAD Designers, CNC Operators, and Pattern/Diemakers continually implement design and manufacturing enhancements to improve tooling quality. Maumee Pattern will design, engineer and manufacture the highest quality tooling for the metal casting industry. We utilize the highest caliber personnel, research, materials, and processing to insure that our tools are at the forefront of technology. Our goal is to deliver these world class tools on time at competitive prices with the highest level of service and integrity, thus insuring customer satisfaction, increased profits, and employee fulfillment.